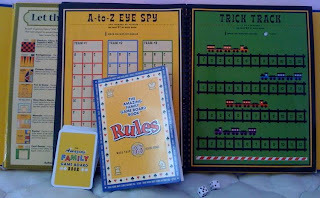 The Amazing Family Game Board Book is one of the best purchases we made. This box full of games was inexpensive, it doesn't take much space and we already played with Avril many games: checkers, backgammon, Chinese checkers, nine men's morris, A-to-Z eye spy, trick track, reversi, mancala, war, go fish, crazy 8s and dominoes. And there are still many games left. Some of the rules are too hard for a 3 year-old, so I had to simplify them a little and it is very hard at this age to lose but otherwise the games are a lot of fun both for my daughter and for me.